Beacon frames are used by the access points (and stations in an IBSS) to communicate throughout the serviced area the characteristics of the connection offered to the cell members. This information used by clients trying to connect to the network as well as clients already associated to the BSS. Here is the frame format of a Beacon frame. Below shows a beacon frame capture. In the frame body section there are few mandatory fields & few optional fields. Here are the mandatory fields in a Beacon frame. 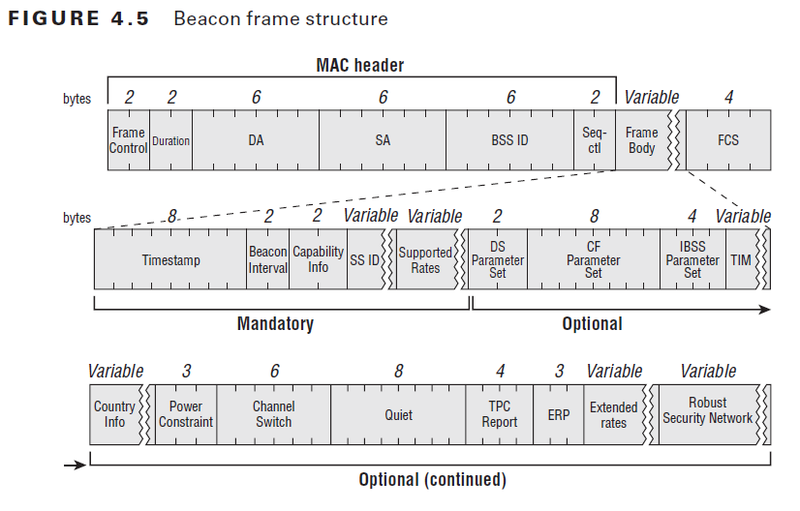 Here is a brief description of each field of a Beacon Frame. If size of the IE specified withing bracket, those elements are fixed length. Other elements are variable in size. A value representing the time on the access point, which is the number of microseconds the AP has been active.When timestamp reach its max (2^64 microsecond or ~580,000 years) it will reset to 0. This field contain in Beacon Frame & Probe Response frame. This field contains number of subfields that are used to indicate requested or advertised optional capabilities. Present in all Beacons, probe requests, probe responses,association request & re-association requests. Element ID is 0 for the SSID IE. SSID could have maximum of 32 characters. This is present in Beacons, Probe Req, Probe Res, Association Req, Association Res, Reassociation Req and Reassociation Response. It is 8 octet field where each octet describe a single supported rate. Last bit (7th) of each octet indicate whether the data rate is “basic rate or mandatory” or “supported rate”. If 7th bit value is 1 it indicate a basic rate where as if value is 0 indicate a supported rate. The next 7 bit (0-6) specify the data rate value in units of 500kbps. Present with beacon frame generated by stations using Clause 15, 18 or 19 PHY or if the beacon sent using one of the rates defined by one of the clause. Present only within beacon frames generated by APs. TIM element contains information useful for stations in low-power mode. 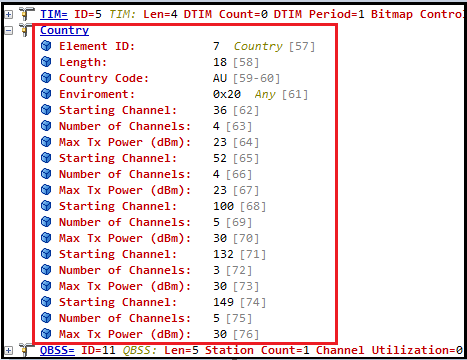 The AP uses Delivery Traffic Indication Map (DTIM) to inform the cell if it has broadcast or multicast frames buffered. DTIM is not present in all beacons and all TIMs. e. Bitmap Control (1 byte) – if 1st bit=1, buffered multicast/broadcast data at AP, if 1st bit=0, no multicast/broadcast data at AP. f. Partial Virtual Bitmap (1-251 byte) – represent stations in low power mode for which AP has traffic buffered. Each country has regulatory bodies that limit the channels or power levels allowed in their regulatory domain. It defines the country of operation along with the allowed channels & maximum transmit power. This is not a mandatory field in a beacon. This element is related to 802.11h. This is for UNII2 & UNII-2 extended (CH52,56,60,64 & CH100-139) where spectrum is used for other purposes like civilian airport radar, weather radar. So to avoid interference with those systems AP should operate max power specified by these constraint fields. This is also related to 802.11h. When a radar blast is detected, all stations must leave the affected channel. The AP can set to announce to the cell which is the next channel. Another element related to 802.11h where an AP can request a quiet time during which no station should transmit in order to test the channel for the presence of radars. This element is also related to 802.11h. TPC Report element contain Transmit Power & Link Margin information, usually sent in response to a TPC Request element. Below shows the “TPC Report” element of a beacon frame. c. Any other management frame (except probe request) is received from neighboring cell supporting only nonERP data rates. Extended Support Rates element specifies the supported rates not carried in the Supported Rates Element. It is only required if there are more than 8 supported rates. This element also used in when QoS is supported. In most QoS enabled network this field is not used, instead same information provided via WMM or WME vendor specific elements. This element is used only when QoS is supported. It is used as a replacement to the EDCA parameter element when EDCA parameter is not present. 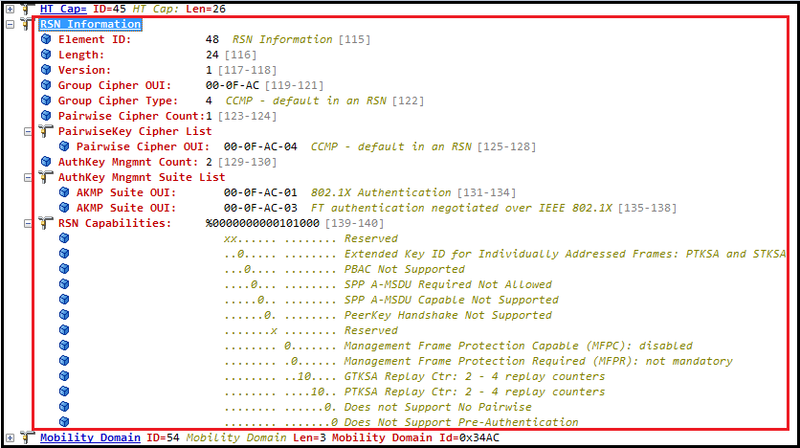 If AP supporting 802.11r (Fast Transition BSS), it will use Mobility Domain IE to indicate that. Below shown a MDIE of a beacon which supports FT-over-the-DS. 40. Overlapping BSS Scan Parameters. how can I remove TIM information from beacon only for a specific WLAN on a WLC?? Ive disabled B mode support on a router, and i still see 1(B), 2(B),5.5(B)and 11(B) as a supported rate. The B mode client doesn’t see the SSID. Can you explain why disabling B mode does? I also notice it had rates for 6(B) and 12(B), making them mandatory too. So if the rates are mandatory for something the client can’t do , does that means the can’t see the SSID? hi do legacy systems have dot11SpectrumManagementRequired attribute? Where are you capturing these packets. I am trying to do the same in wireshark but it seems in ubuntu, latest version of wireshark is not showing the Radio measurement field in capability info. But in the capability info value I can see radio measurement enable. Also in response the mobile devices which supports radio measurement are sending radio measurement bit enabled and devices not supporting are not enabling the same bit. 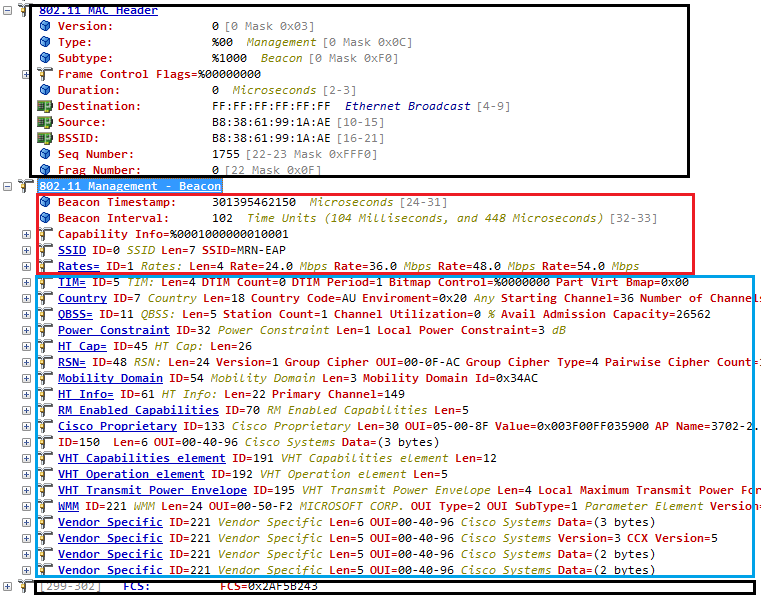 In wireshark, I can see Capabilities Information : 1401 in beacon packet which shows that AP supports radio measurement. In the bit description of capability info bits just below, I can see some bits like 1: ESS capabilities, 1: Short Slot time etc. 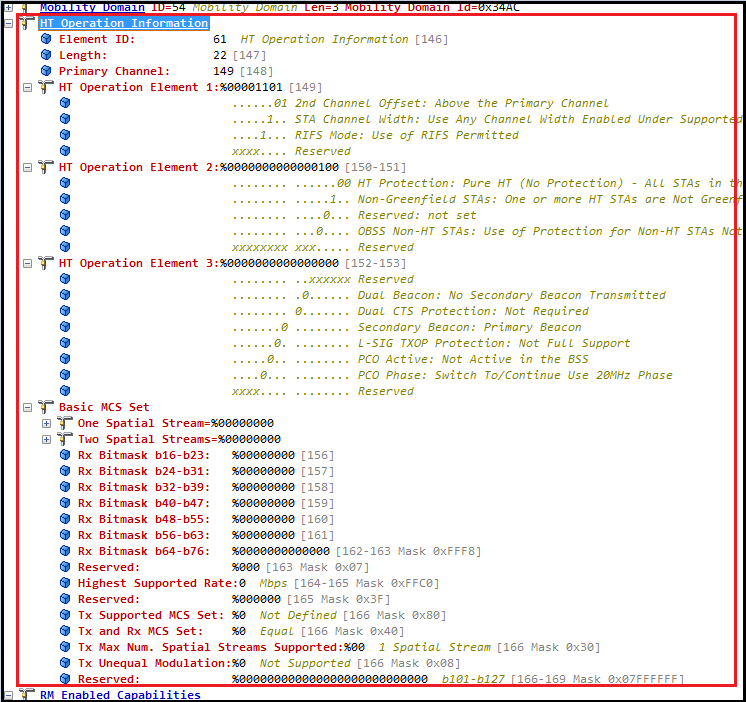 But I can’t see any Radio Measurement field there as shown by you in your packet capture screenshot. Hi, is it possible to assign different sleeping/ wakeup interval for different stations (legacy station / .ax capable stations) ? Hi,do you know about the QosI see some APs’ Qos info are 10001001,but mine AP’s Qos info is 10000110.And i do not know how to set the Qos info. Which information field you talking about & what type of wireless frame ? if a device (client) is not “n” capable, we wont see HT capabilities in its probe request frames for the simple reason that it is not capable of 802.11n. Likewise if 802.11n mode is disabled for an AP even though it is “n” capable, will the beacon and probe response contain HT capabilities? My understanding is it should not. I would like to pick your brain on this. Yes, your understanding is correct. AP should not announce it’s ‘n’ capability as part of beacon and probe response if ‘n’ mode is disabled. I just want to get a list of Open WiFi Networks in the area. Yes, in the beacon frame it defines an Information Element stating if the said supports WPA. If this Information element is missing , then the SSID is Open. Thanks for responding to these queries, much appreciated your help to the community. Where would I find this Information Element? Which bytes in the Beacon Frame should I look at? What are the mandatory or optional parameters necessary to calculate the Throughput of any WLAN network. ?? How a station is able to maintain connection to his associated access point ? How an access point is able to know if the station is out of range (or just offline) ? Is there a response message from clients to that Beacon Frame? That is, before the client decides or not to connect to that AP, does the client respond with a response message to Beacon Frame? Client will do Probe Request (& AP will send probe response ) prior to association. Beacon frames use to advertise SSID capability & send as broadcast, so it is not expect to response for a broadcast frame.